VANCOUVER - The leaders of British Columbia's two main political parties stayed in their comfort zones Thursday, with Liberal Christy Clark touring oil-and-gas country, while New Democrat Adrian Dix went to Vancouver Island to announce a $372-million plan to spend more on teachers and students. The first three days of campaigning have solidified the message both camps are trying to hammer home: The Liberals want voters to buy into the promise of economic riches in the future in exchange for modest spending now, while the NDP is touting a government that would end the era of government cutbacks in social programs and put paying down the deficit and debt on the backburner. The fiercely-fought campaign in the two main camps has made it difficult so far for the usual special interests in the province to get their message out and there's been scant coverage of the campaigns of the B.C. Conservatives and the Greens. Dix told a crowd of parents and children who were at his announcement that 12 years of Liberal cuts and confrontation has left British Columbia with too many overcrowded classrooms. An NDP government would spend $372 million over three years, including $265 million to hire new teachers, counsellors, education assistants and librarians. He said the money could be used to hire up to 1,000 specialized classroom assistants. "If you look at what's happened over the last 10 years, education has unfortunately been a battleground, and kids have suffered, and so we have to change that and that's what this plan seeks to do," he said. The NDP also announced it will provide $100 million to lower costs and more child care spaces for infant and toddler care. The money will reduce fees at existing licensed infant and toddler care facilities by 20 per cent and save families up to $2,000 a year. The New Democrats also say another $300 million that is sitting in the bank from the current Liberal government's RESP fund is being set aside for use on other issues involving children, though the party declined to elaborate. In British Columbia's northeast, Clark toured a water reclamation plant that takes sewage and purifies it for use in fracking. The average family income in Dawson Creek is $74,000, Clark said, noting "natural gas will provide jobs for British Columbia and not just any jobs -- high-paying jobs." "LNG is the industry that will make British Columbia debt-free," Clark said. The Liberal leader has said the export of LNG is worth $1 trillion in economic growth over 30 years. The product will fetch five times more overseas than it will in North America. 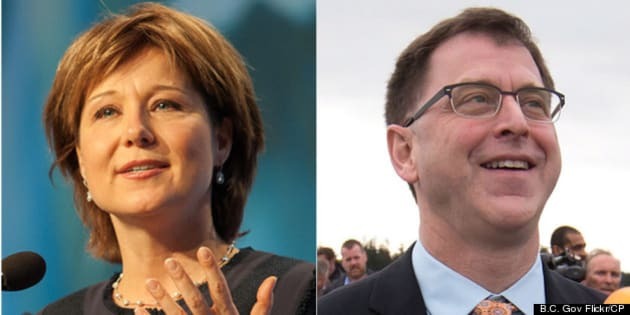 Clark's campaign has continually tried to suggest that a "tax-and-spend" NDP government would cost the province jobs and she said Thursday an NDP government would mean the death of the opportunity LNG could provide. At a rally in Fort St. John, Clark told supporters the NDP wants to put a moratorium on fracking. The party's proposal for a new natural gas tax would "threaten this industry at the worst possible time." "Those companies would start thinking about going somewhere else," Clark said. The New Democrat platform released last week said an NDP government would expand the province's carbon tax to include vented emissions from oil and gas operations. NDP finance critic Bruce Ralston said at the time that the expansion would spur industry innovation and capture an additional five per cent of carbon emissions in the province. The New Democrats said the expansion, effective next April, would add $35 million to provincial coffers the first year and $100 million by 2016-17. New Democrat MLA John Horgan, the party's energy critic, said in an interview that his party would review LNG plans, but he denied the NDP was opposed to the industry. "Our objective is not to constrain," said Horgan. "Timing is certainly of the essence, but haste is often followed by failure. But we're not holding up developments. Full speed ahead. We are going to conduct a review as the industry carries on." As the two main parties attempt to define the election campaign, issues groups such as British Columbia's environmentalists and the increasingly vocal lobby for relaxed laws governing marijuana are also trying to have their voices heard. Stop the Violence BC -- a coalition of police officers, doctors, lawyers, current and former politicians and academics -- argues a regulated marijuana market could stifle the flow of funds going to organized crime and reduce the proliferation of illegal grow-ops in B.C. The group issued a news release Thursday advocating for the provincial government to get an exemption to the Criminal Code to allow a trial that would allow adults to purchase pot legally so researchers could study whether legalizing it would have an effect on users, cut organized crime and offer potential tax revenue. Meanwhile, environmentalists launched an on-line petition Thursday demanding B.C. 's politicians commit to protecting lowland forests from logging as part of the fight to preserve the endangered mountain caribou.